One of our favorites of all time, this Marinated Grilled Flank Steak is so versatile and easy; try it at your next outdoor event. This recipe is from the first Junior League of Denver Cookbook, ‘Colorado Cache‘ which was first published over 30 years ago. It was also the first cookbook I bought when I moved to Colorado as I wanted something to add to my library that would include some regional favorites. Moving from North Carolina to Colorado was a cultural food shock but I quickly fell in love with fajitas and I found this recipe to be a great one to use when making them at home. It’s funny to recall that at the time, I remember hearing myself say ‘hold the jalapenos’ but now can eat them raw and in abundance…so they are now included in the list of ingredients I use when making fajitas. I love the versatility of flank steak; it’s amazing how adaptive it is to different marinades and if cooked properly, this typically tough piece of meat is a lean, tender and versatile dish to have in your repertoire. Mix all marinade ingredients together in a large flat dish. Add flank steak and coat liberally. 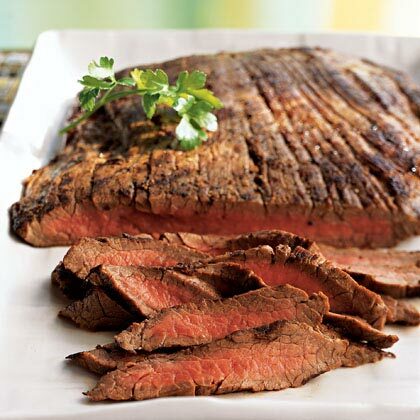 Marinate flank steak, turning occasionally, for 2 to 12 hours in the refrigerator. Grill steak over medium high heat for 5 minutes per side. Remove from grill and let sit for 5 minutes. Slice meat on the diagonal across the grain and serve. Set out warm flour tortillas, guacamole, grilled onions, tomatoes, cheese and salsa and build your fajita! I love fajitas–and still have to make a flank steak. This sounds wonderful! Yum!!! I’ve been wanting to grill and post about my first ever marinated grilled flank steak recipe. Yes, so versitile, easy and tasty. Great photo as always Barb. Let me know when you’re able to get out and about…we need to do lunch. I’m getting close…let’s schedule something; after all…we have to plan the SW Food Blogger’s Conference; all four of us! I love flank steak, but have been so disappointed that the price has seemed to skyrocket in the past year or so. It used to be so cheap! I never would have thought of fajitas as being a regional favorite in CO, but I’m a huge fan too. Especially with jalapenos.